n her latest documentary, "Elements of One," Canadian filmmaker Eve-Marie Breglia explores the transmission of musical languages throughout the African Diaspora. She traverses the planet with groups of musicians tracing the origins of their ideas and testing some hypotheses about the relationship of words to rhythms and esoteric ideas no less lofty than the structure of the soul. The film opens with a haunting scene of Chicago-born saxophonist and composer Steve Coleman bouncing his sound off the interior walls of the King's Chamber of the Great Pyramid in Egypt. Later in the film we learn that the notes he plays are the sonic representation of the proportions Plato and Pythagoras believed to be the basis for the structure of soul and therefore the entire cosmos. These sacred notes have been heard before: they comprise the opening sequence in John's Coltrane's ballad, "A Love Supreme." The portrayal of the artist as transmitter of knowledge brings to mind the archetype of The Magician, or Trickster as he is known in the Cuban Yorùbá Lucumi religion. Clever beyond words, The Magician is bursting with information that he must share and, destined to fulfill this mission, he will find or invent whatever means are necessary to communicate. Captivated by the possibility that there is one creative principle behind all diversity, The Magician journeys throughout the world arranging demonstrations of his ability to harness nature's energy for his purposes. "I believe that sound has information in it," says Coleman early in the film. "It is encoded with information and that information affects people in real ways." Steve Coleman is a force majeure in what he has called music based on the living experiences of African-American people and the African Diaspora. (Like some of his predecessors on this path, he resists using the word 'jazz' as it was invented by and for the marketplace.) 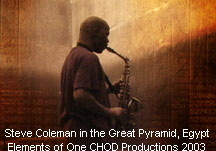 "Elements of One," recently released on DVD, documents Coleman's odyssey over six years as he collaborated with virtuosic artists in Cuba, Senegal, India and various cities in the United States. Dense with imagery of these creative cultural adventures, the film portrays the process of discovering and sharing musical languages and the symbolism carried in movement and rhythm even when common spoken languages were unavailable. Music and dance, and especially certain rhythms, have for centuries been the essential technologies of the Cuban Yorùbá Lucumi religion which was originally brought to the island with the slaves from Africa and has, since then, been thoughtfully passed on from generation to generation. Meanwhile, the slaves in the United States were forbidden to use drums as these instruments were a suspected means of secret communication. The elimination of the drum as a form of expression along with efforts to suppress singing and dancing eventually led African American musicians to turn to the only means available to them: the instruments of the marching bands and orchestras. This led to the new sound created in New Orleans around the turn of the last century. As this contagious sound developed and spread in its multiple and divergent forms throughout the United States, a curiosity about the music played by their spiritual brothers and sisters in the Caribbean, and especially Cuba, led to creative pilgrimages by American masters including Dizzy Gillespie and John Coltrane. Longing to re-connect with the African roots of their own music and finding inspiration in the passion and intelligence of the Cuban artists, a natural synergy led to exchange of ideas with artists living on the Caribbean islands. These influences shaped and inspired the North American musical repertoire as composers, according to Coleman "kept trying to get that [African] sensibility with our Western instruments." Of course, access to Cuba abruptly ended when the United States invaded Cuba in the early 1960s and instituted the now middle-aged embargo. Entire generations of American musicians have known only this politically-motivated stifling of creative exchange. Thanks to a perhaps unofficial leniency practiced by the Clinton administration, Americans were able to travel to Cuba in the 1990s without the fear of harassment and worse that are again being inflicted by the Bush administration. Fortunately, Coleman made multiple trips to the island during this time and Breglia captures much of what he saw and did. Along with other like-mindedly curious and capable musicians accompanying Coleman, he worked with his Cuban collaborators to explore similarities in the underlying principles and concepts found in their respective yet related forms of expression. Breglia's complexly woven film depicts what drummer Gene Lake refers to as ''the three-fold process" of learning what the Cubans were playing and the science behind it, sharing with them what the Americans were doing and, finally, creating something they could do together. The result was performed at the Havana Jazz Festival and later released as a compact disc entitled "The Sign and the Seal." From Cuba, and with several of the Cuban drummers and their sacred drums in tow, the group migrated to Senegal for further exploration and collaboration with a group called SingSing Rhythm. The film poetically portrays the similarities in the natural beauty and street-life in Havana and St. Louis, Senegal, and in rehearsal as the artists shared with each other their convergent musical languages. The Cuban musicians hold tight to their musical, religious and cultural traditions while the Africans, having never experienced the threat of silencing, express both their heritage and its constant transformation. The rehearsals in Senegal, similar in creative intensity to those in Cuba, are processes of sharing among the musicians and discovering, as the director of SingSing says, that when he hears the Cubans play their music, he feels himself. After Oakland, a smaller-scale group, still under the leadership of Coleman, traveled to Madras and Bangalore in Southern India. Working there with members of the Karnatic College of Percussion, the exploration of the language of the drum continues. The tender South Indian singer Sankari Krishnan serenely vocalizes the vocabulary of the drum and Coleman picks up and plays her melody on his alto saxophone. As with the Cuban and African segments of the documentary, Breglia sensitively shares the dusty streets and vibrant farmland and the ever present appearances of sacred cows. A brief but riveting appearance by an Indian dancer that culminates this section and the mesmerizing performances of the African and Cuban dancers seen throughout the film are endowed with meaning. 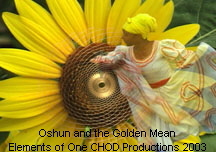 Early in the film, the Cubans speak of their choreographed ceremonial offerings to the pantheon of Yorùbá deities. This contrasts sharply with the American's concept of including dance. Neither integrated nor innovative, the bitter-sweet eye candy grafted onto the music is a telling symbol of America's cultural immaturity. Where the African, Indian and Cuban movements are ritualized moving prayers, by contrast the performances accompanying Coleman's performances appear curiously shallow. The closing section of the documentary is devoted to the esoteric questions that animate Coleman's thinking about music. A tireless intellectual and spiritual seeker, he looks to sources reaching back through Plato, to Pythagoras and the ancient Egyptians to understand the proportional relationships that explain beauty and symmetry in nature and the logic of harmony. During a residency at IRCAM in Paris (Institut de Recherche et Coordination Acoustique/Musique), he rehearsed a band to perform with 'Rameses,' a computer program he designed to improvise in real time as a member of the band. Programmed based on notions of proportion found in the Golden Mean, astrological relationships and the numerical associations of words, the computer debuted on the stage Bouff du Nord in Paris on June 11, 1999. In spite of a relatively short rehearsal period and a less than inspired performance by most of the musicians, the European audience's enthusiastic response bordered on ecstatic. In a brief clip of a conversation between Coleman and the brilliant musician, composer and technological innovator George Lewis, Lewis describes the traditional role of African Americans vis-à-vis technology: Those not aware of the technological impact that African people have had since ancient times have assigned them the role of the faux primitive so as not to sully their spiritual purity. Breglia's film makes a convincing case that technologies such as music and dance are powerful forms of prayer that serve humankind's immutable need to communicate. All prior issues are secured in the Scene4 archives. Have you read the Classifieds? © 2000-2005 Scene4 - International Magazine of Performing Arts and Media - AVIAR-DKA Ltd. All rights reserved (including author and individual copyrights as indicated). All copyrights, trademarks and servicemarks are protected by the laws of the United States and International laws. Reproduction in whole or in part without permission is prohibited.